Frenetic, funny, and most of all poignant, Modern Family’s finale delivered in the final scene. The writers have been multi-tasking quite a bit this season, trying to hit various storylines and incorporate all of the characters. During the first two thirds of the episode, I was worried that the scribes had bitten off more than they could chew. But the conclusion of season five was so wonderful, it made the rest of the episode worth it. Mannie was crying up a storm at Cam and Mitch’s wedding, and I was right there with him. Let’s take a look at the many vines in Part 2 of “The Wedding.” First off, Cam and Mitch have to keep relocating their nuptials because of a California fire. Finally, the fight between Jay and Mitch is resolved when Jay shows his true acceptance of his son and hosts the wedding at his club, proudly acknowledging his son’s marriage. He even walks Mitch down the aisle. In the meantime, Hayley’s repressed crush on Andy the male nanny comes to light. It seems like they’ll finally be together, but in a surprising and bittersweet moment, they don’t do it. That storyline has been a slow burn, but I’m enjoying the time they’re taking to develop their relationship. In the smaller plots, Cam’s parents are still fighting (I could have done without this storyline). Phil steps in last minute as the officiant of the union, and egocentrically hopes to sprinkle in some magic tricks. And there’s a running joke where Mannie and Luke are accidentally saying romantic things to each other. Kinda funny, but saying seemingly homosexual comments is Phil’s running gag, and honestly, no one can compare to how well Ty Burrell delivers his misunderstood lines. There were mixed reactions to this season, and it’s easy to see why. Season five’s episodes tended to be a bit manic. With the kids growing up, writers are trying to integrate their storylines as if they’re protagonists in what is already a full house. Last night, the focus should have been romance. While Phil is always funny, having him incorporate magic into the wedding scattered the emotion of the story. And while Cam’s parents’ story was about romance, they aren’t central characters, and should not have had such a limelight in the finale. Though it was touching to see Jay finally take pride in his son’s extravagant wedding, not enough time was spent on their resolution. Three episodes were spent on their fight. Three episodes. Modern Family doesn’t usually take more than one episode to resolve a fight, and it took three, which resulted in an anti-climactic climax. I was disappointed with how swiftly that fight was wrapped up. Perhaps if less time had been spent on other (less interesting) plots, this thread would have had more time to stew. However, I’ll throw all those criticisms away to save space for laudations of that final scene. Being one of the most popular gay weddings in primetime, it was a landmark moment in TV history. However, while I went into the show with that in mind, I honestly wasn’t thinking of all this when I watched Cam and Mitch get hitched. In fact, I wasn’t thinking at all. I was feeling. Feeling happiness. Cam and Mitch’s love is so palpable, it could inspire any stoic to turn into a romantic. Which brings me back to the external, reality point. By sticking to the truth of their love, Modern Family accomplished much more than they would have had they used words and speeches to make a point. Words can never convince anyone as much as actions and feelings, and this scene was chock full of powerful actions and inspiring feelings. 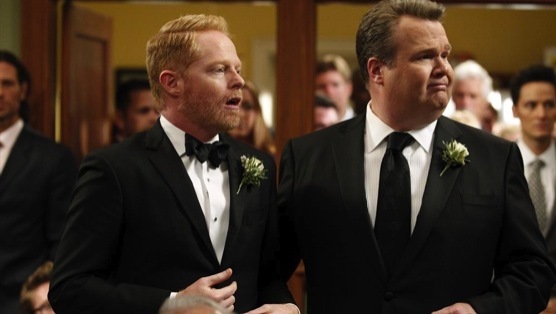 Thank you, Modern Family, for honoring me with a front row seat to Cam and Mitch’s wedding. See you guys when you get back from your honeymoon in Season Six. I’m sure there will be plenty of hilarious stories to tell.